Houses and condo towers are seen in Vancouver, B.C. 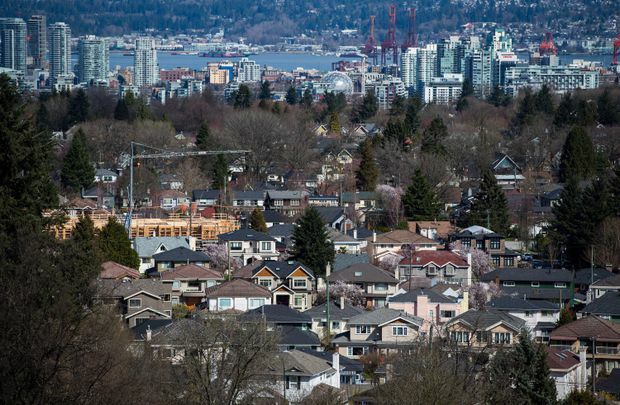 Tax-based policies intended to ease British Columbia’s housing crisis will generate significant new revenue for the provincial government while having little effect on home prices, according to a new report that says B.C. should instead address regulatory barriers to creating more housing supply. Report author James Tansey, executive director of the Centre for Social Innovation and Impact Investing and an associate professor at the University of B.C.’s Sauder School of Business, said the government’s own projections suggest increases in the property-transfer and foreign-buyers taxes, and the new taxes on vacant and expensive homes, will not reduce housing prices. The property-transfer tax, which has been increased to 5 per cent on homes that cost more than $3-million, is projected to generate $81-million each year from 2018 to 2021. The taxes on empty homes and homes assessed at more than $3-million, meanwhile, are expected to bring in about $200-million each annually. A different approach to reducing the cost of housing would be to focus on supply by removing regulatory barriers to creating more housing stock, the report says. This includes increasing the pace of rezoning and permitting, and reducing development fees to allow higher-density housing in areas dominated by single-family homes. The report cites a C.D. Howe study that suggested regulations can add up to $600,000 to the cost of a new detached home in the Metro Vancouver region. “If you imagine reducing those costs by half, or a quarter, you’re taking $300,000 to $400,000 off the cost of a new home,” Dr. Tansey said. Premier John Horgan defended the housing-related taxes, but said his government is also working on increasing housing stock. The Premier said revenues from the taxes are “going right back into building more housing,” but that will take some time. Some British Columbians say the taxes target them unfairly. Last weekend, homeowners packed a gymnasium on Vancouver’s west side to voice concerns about the tax on luxury homes, which will create new tiers of the school tax paid on properties assessed at more than $3-million and $4-million. Those who have seen property values soar on homes bought decades ago are suddenly on the hook for thousands of dollars more per year, which some – such as seniors on fixed incomes – say they cannot afford. And in March, the B.C. government tweaked its so-called speculation tax on vacant properties after outcry from British Columbians with vacation homes in the province and communities that rely on part-time residents.